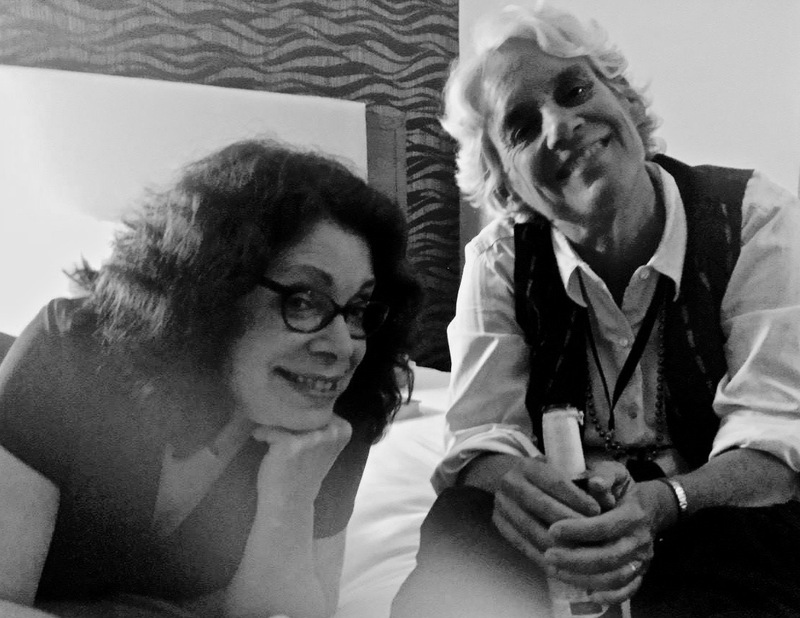 JENN McKINLAY: Three years ago at Left Coast Crime in Phoenix, I was sitting outside the Sheraton with my pal, Kate Carlisle, when we were joined by two other authors whose books I'd read and loved. The four of us ended up talking for hours and much hilarity ensued, because of course it did - look who I was with! Those writers were Leslie Karst and Ellen Byron. So, when the Lefty noms came out and I saw they were both nominated, I had to ask...so how's that feel going up against a bestie? And here they are to talk about it. Welcome, Leslie and Ellen. Ellen and Leslie: When the Left Coast Crime award nominations were announced a few weeks ago, it wasn’t surprising that our first impulse was to call each other. After all, not only had we been pals ever since meeting at the California Crime Writers conference back in 2015, but we also share the same publisher (Crooked Lane Books), andwe’re both members of the fabulous Chicks on the Case blog. Which makes us almost like sisters, right? 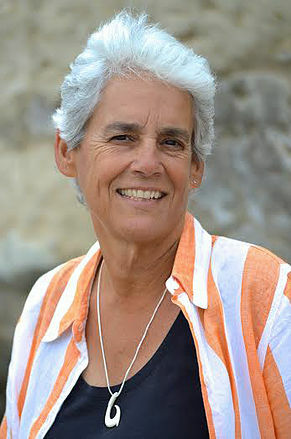 LESLIE KARST: Ohmygod, Ellen! I had to read that email like six times to make sure it said what it did. Can you believe it? Both of us nominated? In the same category? And Cynthia and Kellye, too! Dang. It’s a veritable Chicks-fest! ELLEN BYRON: I AM SO EXCITED!!!!!!!!!!! I AM SO EXCITED!!!!!!!!!!!!! Can I share a room with you at LCC? Because I’m excited, but also cheap. Leslie:[Laughs.] Absolutely, let’s be roomies! It’ll be super fun! We can have big parties in our room every night after the bar closes! Oh, hey—and that way, I’ll be assured that you won’t even consider knocking me off to lessen the competition, since then you’d be stuck with the entire bill. Ellen: Damn, there goes Plan A. You know, it should feel weird that we’re competing in the same category but it doesn’t. I love you too much. Same with the other Chicks, Kellye and Cynthia. So that leaves Catriona and Tim. I am taking them DOWN! But back to our relationship. Honestly, I would be totally thrilled if you won, Leslie. I’ll never forget when you came running up at CCWC and threw your arms around me in the biggest hug ever. You know how you instantly feel someone is a friend soulmate? That’s how I felt the instant we met. Leslie: Same for you, girl. Remember how your first book, Plantation Shudders, was coming out in like two months, and I’d only just turned in my manuscript for Dying for a Taste to Crooked Lane? I knew diddly-squat about publishing and peppered you with all these newbie author questions, but you patiently explained to me all the crazy stuff I’d have to navigate over the next year. I swear, you immediately became like my big sister that day. 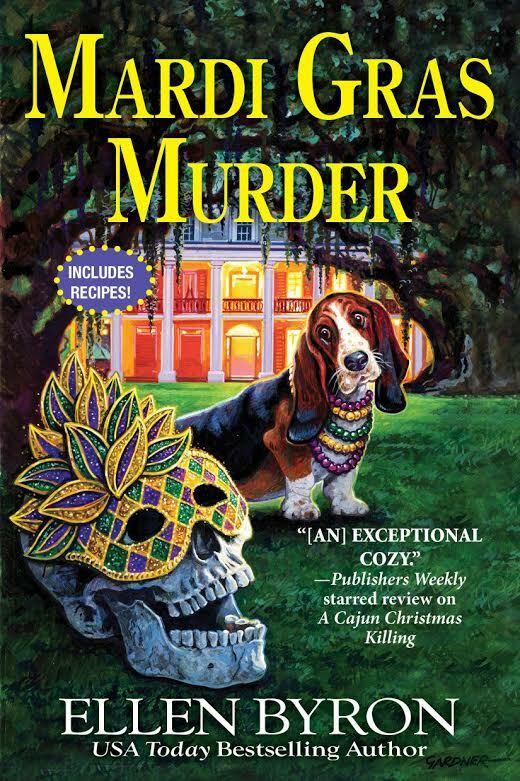 Oh, and speaking of books, Mardi Gras Murder SO deserves that nomination! I love how you include all that fascinating Louisiana history about the Orphan Train in the story, but it’s still laugh-out-loud funny at the same time. Must be all that TV writing you have under your belt. Hey, ya wanna maybe give me some lessons, some day? Ellen: Hah! Like you need lessons. I’ve been a fan of your series ever since I cracked open Dying for a Taste. 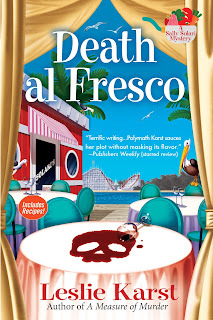 I love how you weave different arts into all your books, like Sally joining a chorus in A Measure of Murder and taking up painting in Death al Fresco. The series is so smart and funny. And your recipes are to die for! I swear, recipes are the hardest part for me. In my next book, Fatal Cajun Festival, I finally gave up on one. Instead I wrote “R.I.P. Sweet Potato Pralines,” and explained that no matter how hard I tried, I could not come up with a decent recipe. I had to do something, because I make such a big deal about sweet potato pralines in the book. Ellen:[Sighs.] Oh well, there goes Plan B. To celebrate their exciting news, Ellen and Leslie will each give away a copy of their Lefty-nominated book to one lucky person who comments on this post below! Thanks so much for joining us, Leslie and Ellen. So, Reds and Readers, have you ever been up against a pal for an award? How did you handle it? Ellen Byron’sbestselling Cajun Country Mysteries have won Best Humorous Mystery Lefty awards and been nominated for multiple Agathas. 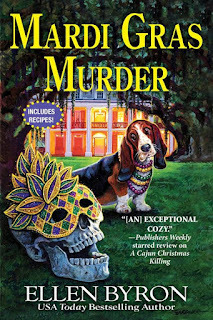 Mardi Gras Murder,the newest addition to the series, garnered Ellen her fourth Lefty nomination. Writing as Maria DiRico, she’ll debut a second series, The Catering Hall Mysteries, in 2020. Her TV credits include Wings, Just Shoot Me, and Fairly OddParents.Fun fact: she worked as a cater-waiter for Martha Stewart. The daughter of a law professor and a potter, Leslie Karstlearned early, during family dinner conversations, the value of both careful analysis and the arts—ideal ingredients for a mystery story. 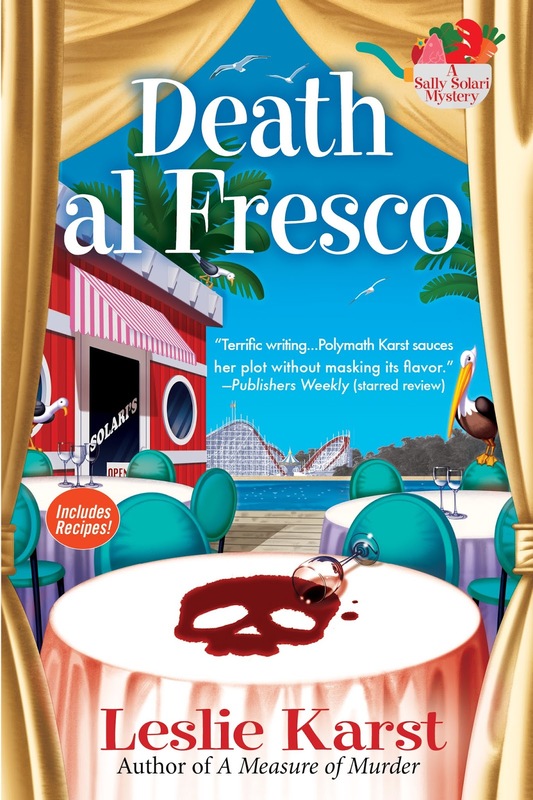 Putting this early education to good use, she now writes the Sally Solari Mysteries (Dying for a Taste, A Measure of Murder, Death al Fresco),a culinary series set in Santa Cruz, California. 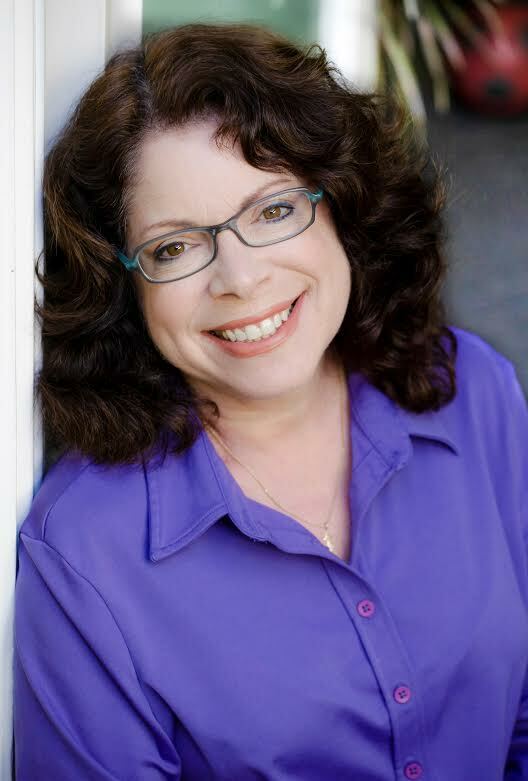 An ex-lawyer like her sleuth, Leslie also has degrees in English literature and the culinary arts. The next in the series, Murder from Scratch, releases April 9th. Congratulations on your award nominations, Leslie and Ellen. Can’t say as I’ve ever been up against a friend for an award, but I’d hope to handle it as well as Ellen and Leslie seem to be doing. . . . . They are a dynamic duo! We really do love each other too much to feel competitive! Indeed, Ellen--no competition, just joy at experiencing this together! Congrats to you both on your well deserved nominations. If you haven't read these books, they are both fabulous! And yes, I might have actually laughed out loud while reading this post. Maybe you can kill each other with laughter. Or did I just give away plan C? Placn C - too funny! Congrats to both of you (and Kellye and Cynthia)! I'm trying to think if I've ever been nominated for an award. I doubt it. Be honest though, as happy as you might be for your fellow nominees, when you submit your ballot you're going to vote for yourself, right? I mean, let's face it. Friendship only goes so far! LOL - I was thinking about that but didn’t go there! I am so happy for both of you! I love your books and am always so excited when a new one comes out! So...um...you guys do realize that this rival thing at a book awards would make for a great mystery, right? Not that I would want ANY of you knocked off, but just think how it could play out! A group of mystery writers, at a convention, all friends, yet rivals. Tons of fun and parties and on the morning of the BIG award, one of them is found dead, murdered with her own lanyard! Just saying! Death by lanyard - Ack! I’m never wearing one of those again! Murdered by her own lanyard. BRILLIANT! I've never been up against a friend for an award but I did coach against a friend in a basketball title game. My team had won the year before and though we weren't favored to win the next year, we got back to the final game. We had a lead at halftime but ended up losing the game. My friend's team had one of those transcendent talents and while we held him in check in the first half, we couldn't do it for the whole game. As for how we handled it, we simply went about doing what we could to try and win the game. Neither one of us felt like we had to be "rivals", it was just how the season shook out. After the game was over, we ended out at the bar together for the end of year coaches party. Don't get me wrong, I hated losing that game but it wasn't like I was going to put out a hit on my friend or anything. You’re making me miss my basketball playing days! Excellent sportsmanship there. Did you know each other’s plays? Did that help or hurt? Or was it really all about keeping a man on their super talented one? I used to fence competitively against friends in college, which actually made it more fun. Et là! Jay, if only parents at games today instilled your attitude into their kids. Jenn, we had a general idea of what the other would do in the game. He had a more high flying offense while my team was built on defense first. We could score but I'm a defense fan so that's how I built the team. It didn't really help or hurt. We just couldn't stop that kid in the 2nd half. BTW, that kid went on to be the star player on a state championship team in high school and would've had a full ride to a Division 1 school if he'd managed to keep out of trouble. Oh, and the last couple of years that I coached, I was a head coach for a girls team and assisted my friend with his boys team. Leslie, when you spend 25 years coaching in a town league, you are always matching up against friends so it wasn't that big of a deal in the grand scheme of things. Of course, I coached so long that I had former players of mine get into coaching. Of all those that did, only one was ever able to beat one of my teams and that wasn't until my last year as a coach. Four of them eventually went on to coach teams to titles of their own after I was out of coaching. Ellen, I've had my moments when I was not quite so sportsmanlike, so I'm not a saint. One game, the ref clearly had it out for my team. He TOLD the other ref that he was going to make a certain call before the play even started. So I went ballistic when I found that out. But overall, my philosophy is that I expect a championship level effort in every practice and game. We may not win every game but we are sure going to try. I made my teams play each half as if the score was 0-0. And I made sure everyone played their required time as well. I've had some really bad players but they got on the court just like the "superstars". Mainly because when I was a player, I was one of the bad ones. I knew what to do, I just couldn't physically do it. Also, while I'd do whatever I could to try and win, I won't cheat. And when I switched to coaching girls, my philosophy stayed the same. Which ticked off the other girls coaches. Because when my team was handing out beatdowns in an undefeated season despite half my team never having even played the game before, it was because I treated them as BASKETBALL PLAYERS, not GIRLS BASKETBALL PLAYERS. What a delight to see these two friends here, both of whom I count as good friends of mine, too! I met Leslie when WE roomed together at LCC in Monterey, and I love both their series. You ladies are going to rock this thing. Last year my blogmate and dear friend Jessie Crockett and I were both nominated for an Agatha for Best Historical Novel. As it happens, Rhys won, a well-deserved prize for In Farleigh Field! But I knew if Jessie won I would have been over the moon for her. Have a great time in Vancouver, Leslie and Ellen. I'm delighted I get to see Ellen in few weeks in LA, and hope to see you both at Malice, too. Hugs! Edith, you remind me that we do belong to a lovely community of writers. So many great writers with kind hearts. Indeed. It would be difficult to get a nomination and NOT go up against a friend, given how closely knit the mystery community is. And thanks, Edith! And good luck with your Agatha nom, ma cherie! Times like this are when "it's an honor to be nominated" becomes your mantra, right? The mystery community is awesome, full stop. I always love seeing how much other authors are fans of each other. It's a lesson for us all. Well said, Karen. It really is a supportive industry! I think THAT should become my mantra: "The mystery community IS awesome!" I am ending my self-imposed JRW exile to congratulate you both, Leslie and Ellen! Both your series are a delight and reading your conversation made me laugh and smile this morning. See you in LCC Vancouver next month! Have fun, Grace! I so wish I could go this year, too, and cheer on the nominees! Yay! Thanks and see you there! Hoping we're not about to find out whether a dead author can win a Lefty. Wish I was going to be at LCC to cheer you both on! It would simply be an added plotline for Deb's book, DEATH BY LANYARD! You will love them, Susan! And to Jenn - sorry I didn't get to chime in on your big release day (craziness at the day job). Lucky enough to know Ellen, but not Leslie. Will hope to remedy that. Congratulations to both and can't wait to read what's next. Indeed, Wendell--do come up and introduce yourself if we're ever at the same conference! Wendall, that must be remedied! You will meet Leslie -and you will love her! Thank you, Hank! Yes, we will have too much fun as roomies, you can be sure. And congrats on your Agatha nom, my dear! Thanks, Hank!! We do have a blast. AND... super excited I get to be on a panel with you in May!! I had a great chuckle reading through your post. What great camaraderie! I have not had the experience of being up for any kind of award against a bestie. If it were to happen, I would hope for the same ribbing and pride for each other as you have. I'm sure you would, Lil, because that's what it means to be a bestie! Aww, thanks, Lil. It's so easy to support each other in the mystery world because... I don't know, it just is! A few years back, I was nominated for an Anthony alongside Kent Krueger, whose book was the transcendent ORDINARY GRACE. It was so good, I voted for his book, not mine, and I was entirely satisfied when he won - it was SO well-deserved. My favorite "friends vying for the same award" story? The year Hank was nominated for her FIRST Agatha award. I was up for it too, on my... well, let's just say it wasn't my first. Or second. Hank won! After the ceremony had ended, she rushed up to me looking very anxious. "Is this okay?" she said. "I don't want this to be bad for our friendship." I hugged her, and told her honestly I was happier for her than I would have been for myself. I guess my takeaway is: you never lose when not receiving an award, because, truly, it's an honor to be nominated - and your publisher knows it :-) On the other hand, there's a particular pleasure to seeing your friend win an award for a wonderful book that you also loved. What great stories, Julia. Joking aside, it is hard when you're up against a friend. That happened to me last year. Winning joy was tempered by feeling sad for my friends and honestly, a little guilty. Meanwhile, my daughter's fallen in love with a blind dog at a rescue near her college. I wonder if we can adopt it and get it to Canada in time for LCC? I've never been up against a friend for an award, but if I had, I hope it would be a friendly competition and not a rivalry. Ellen and Leslie have shown us how fun a competition can be and I wish them all of the best! Thanks so much, Celia! Leslie and I are lucky we found each other. Hmm, that sounded a little romantic. Look out, Robin and Jer! Thank you, Chris! And I, too, am excited whenever Ellen releases a new book! I never get nominated for anything so running against a friend is a nonissue. Unlike Hank, I haven’t a single Emmy to my name Or like all of you, I’ve never written anything worth reading. However I do getbtobtake this sling off in two weeks and am the poster child for joint replacement. Lol, Ann. And yay for getting your sling off soon! Ann, you need to write. You're funny! Congratulations! Wonderful accomplishment. Your books sound captivating and special. Thanks so much. Captivating... I like it! Congratulations! What an amazing nomination! Best wishes. Congratulations, Ellen and Leslie! I've never been up for an award against a friend, but I'm sure you both can handle it gracefully. I'm a big fan of both your books and I'm looking forward to new releases from both of you. Thank you, Dianne! It's always wonderful to hear (or read) those words! Dianne, thank you! Like Leslie, I LOVE those words! Congratulations, you two! You are both such fun and your nominations are so well-deserved! I wish I was coming to Left Coast to cheer you on!!! Thanks so much, Deborah! Can't wait for your next book! Deborah, I wish you were coming to Left Coast too. Perhaps you are on a book tour or on a research trip to the UK? How fun! Congratulations to the both of you! I want to read both these books, and try to soak up some of your awesomesauce. LOL, here's hoping you find our books LOADED with awesomesauce! This was such a hilarious read! Thank you for that and congratulations to both of you!!! Thanks so much, Amanda! Glad you enjoyed reading it as much as we enjoyed writing it. and now will add Leslie's series to my list. You both seem like fun people! Thanks, Lynn. And not to boast or anything, but... we are! This is too funny. I love the banter between Ellen and Leslie. Congratulations on the nominations! You are in great company! I look forward to seeing you all at LLC. I remember meeting you at Malice. Thanks, Diana! And do come chat us up at LCC!! I'm so glad you'll be there! Will you be at Malice? Hope so. I'm putting together another Author/Blogger Meetup. Ellen, most likely that I will not make it to Malice this year. Will the Author/Blogger meetup be at Left Coast this year? Congratulations, Ellen and Leslie! I can see that there's not a jealous bone in either of you, only a wonderful friendship that truly wants the best for each other. You are both such accomplished people. Wow! I think you both should receive awards for you body of work both inside and outside of writing. Ellen, I have to tell you that I loved Wings. In fact, my husband loved it, too, and we don't follow a lot of the same shows. Leslie, I don't know which of your many hats I admire the most, but it's nice to know that in your friendship with Ellen if you cook it (culinary degree), Ellen can serve it up right (Martha Stewart experience). Good luck to you both. I wish you both could win. Love that! Okay, Ellen, you heard Kathy: I'll cook it; you serve it up right! Thanks so much, Kathy. And yes to the idea of Leslie doing the cooking! Hahaha! I'm always up for someone else doing the cooking. You two are simply the best! I'm so glad I don't have to vote! I would have to call TIE! I love reading your books because I enjoy learning something new and laughing while I do! My congratulations to both of you! Hugs!!!! Love it, Meg! And thank you! Hugs back atcha, girl! BTW, in case anyone's wondering, that rock-musician-style photo at the top of this post was taken--yes, in the hotel room after the bar closed--at Malice, 2017. Congrats to you both. Love reading both your series. Thanks so much, Lynn. So glad you enjoy them BOTH! Two new authors for me, can't wait to get started. Such a collaborative supportive community here at JRW, you all should feel proud of what you have accomplished. There's a lesson in civility and kindness here that hopefully keeps spreading (perhaps all the way to DC). Awww...that's so lovely of you! It is a great pic!!! Congrats! I am a fan of both of you. I am able to go to places I have never been! I have never been up for any awards. Thanks so much, Marsha!! I sometimes joke that my books are a vacation with murder. So true, with good books! And thanks, Marsha! Congratulations to both of you! I posted around three this morning (insomnia) but my post flew off to the wild blue yonder. I was once nominated for vestry along with other people I knew and liked. It was the situation of 3 openings and maybe 6 candidates. I felt awkward since I had been a member of this particular parish for only about a year. Fortunately it was a nominate and vote in the same afternoon and be done with it! Oh wow, Pat. Did you win? I hope so. If not - their loss! Ellen and Leslie, You're just kidding about these plans, right? Because the rest of us Chicks would really miss you both. And maybe take over all your blog post slots for eternity, heh heh...Huge congrats again on the noms! LOL, Lisa, of COURSE we're kidding. Or are we???????????? Bua ha ha, THIRD evil laugh! Love both your series. Good luck. But not another pen name. You all screw up my record keeping! At least start the last name with the same letter so I can just add the new books to the others. I know, the pen name thing is a pain. BUT here's something sweet. Since the new series is set in Queens, where my family is from, and is inspired by aspects of my life, for my pen name, I chose my nonna's maiden name: Maria DiRico. How mature, especially for a high school student! But I think it's sometimes easier to be the loser than the winner, actually. Congratulations to y'all. I was a bit startled with the Chicks remark, as that is my name. I don't remember being with a friend for an award. Do remember applying for a position with 2 other work cohorts. didn't get the job and Winner and I remained close. Third man out poisoned herself in a vat of jealousy. Good to see when friendship/love are more important than prestige. Thanks for writing funny ladies, I love reading both of you. Thanks so much, Coralee. And Leslie's right, it does sound like a mystery, lol! Sounds like the plot of a mystery novel... And you do have the best name EVER! Nope, I've never been up for an award against a friend. Good luck to both of you! No I never have been up for an award against a friend. I am sure you will be supportive to the other whom ever wins. Best of luck to you both!!! We will. I love ALL the nominees, despite my jokey trash talk re: Catriona and Tim. Yes, indeed--it's a terrific bunch of nominees! Thank you, Bev! Congratulations on the award nomination. I can’t wait to read the books. Congratulations indeed! I have not been up for the same award as a friend. I thank you, too, Linda!